Koreans tend to eat steamed or pan fried mandu in summer and steamed mandu in soup during winter. For the pastry wrapper, Koreans use a variety of flours such as sticky rice flour, buckwheat flour, potato flour or just plain flour. “Kimchi Jjin Mandu” means Kimchi dumplings; this dish is suitable for vegans and when the pastry is very thin and made from sticky rice flour and we call this “Mandu Pi”. I am not going to make the wrappers today but you can buy “Mandu Pi” from a Korean supermarket. One packet contains around 30 sheets they are very small and thin. I used 2 packets of “Mandu Pi”. It comes frozen so must be left at room temperature for at least four to five hours to defrost. Koreans normally make a mandu in a half-moon shape so in this case you just need to fold the pastry in half around the filling and then stick it with beaten egg white. 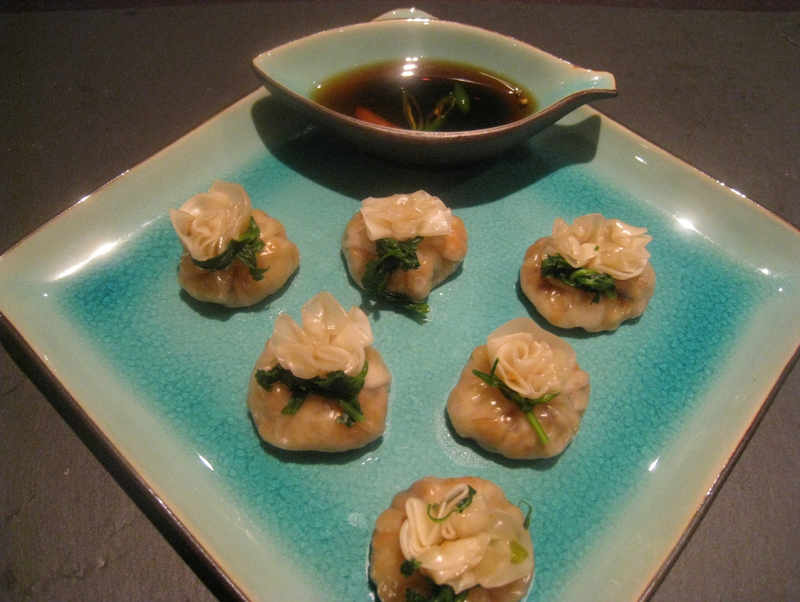 To make my dumplings a little bit more special, and to catch the attention of my guests, by using parsley to tie the open end of each dumpling. I believe that the visual composition of food on the plate is vital. So when we first see food our appetite should come from our eyes but of course the quality of ingredients and the taste of the dish are the key elements. So what is the priority for your dishes? Visual, quality of ingredients or taste? My father doesn’t eat very much and so we say he eats like a bird so from a child I always tried to make his food look as attractive as I could. Unfortunately my mother doesn’t feel the same way and my father has little encouragement to eat well! Bring your pan fried tofu to the chopping board and chop them coarsely. Finely slice the onion squash, sweet potatoes and prepare the chopped chestnuts and pine nuts. Take the kimchi and squeeze any excess moisture out if necessary then chop the kimchi coarsely. Set all these ingredients aside for the moment. Trim and then put the parsley into a pan of boiling water for 50 seconds then take them out and rinse them thoroughly in cold water for a few times then squeeze them almost dry with your hands. The parsley will be kept until the end for tying our dumplings so put them separate from the other vegetables. Trim and then put the beansprouts in boiling water for 1-2 minutes and then take them out and drain, leaving them to cool down. Season the beansprouts with a pinch of salt, sugar, white ground pepper and a teaspoon of sesame oil. Now we are going to cook the Mandu filling. Add 1 table spoon of sesame oil into the frying pan. Stir fry the bean sprouts and shiitake for a minute then add the sweet potatoes, onion squash and stir fry altogether them for an anther minute on a high heat. Finally add the Kimchi, chestnuts, pine nuts and Tofu together with a pinch of salt, a pinch of ground white pepper, tablespoon of sugar, three teaspoons of soy sauce, a tablespoon of sesame seeds, the grated garlic and optionally the finely chopped fresh chillies. Stir fry for a minute on a high heat then take off the heat and leave the filling to cool for 5-10 minutes. Scoop a teaspoonful of the filling into the centre of a Mandu Pi (wrapper). As I said you do not need to make it like me, you can just simply fold them in half around the filling and stick with egg. Fold up in your hand then press the gathered edges together and press to stick them to each other. Put back the Mandu down and tie with parsley, wrapping around twice if your length of parsley allows. Repeat to make as many rolls as you can. Trim the parsley strings to not be too long otherwise their taste will be too strong and they will be too thick and chewy. Use a steamer to steam the Mandu for 2-3 minutes then serve with a a soy and vingear dipping sauce. You can freeze any uncooked Jjin Mandu if you do not want to eat them immediately. Looks delicious! And I agree with you about presentation. I’ll have to find mandu pi. Thank you so much for stopping by and sharing your love for this dish.